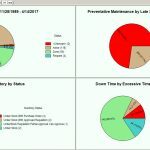 CMMS Software (computerized maintenance management system) for Work Orders, Preventive Maintenance, Downtime and Reliability Tracking, Maintenance Inventory and Purchasing Management by MaintSmart. Helping maintenance managers succeed for over 21 years! Learn how we can help you save time and money while streamlining your maintenance process...create a PM list in 20 minutes or less. Get Your Free Consultation and Demo! NEW! Create PM lists in minutes! NEW! GSA contract for federal government buyers. NEW! Economical user-hosted CMMS subscription. Web CMMS software for work requests. NEW! Embed work order images. NEW! 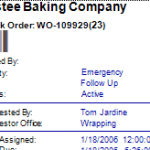 Display your company logo on reports. Automatic work orders by time, day, demand or event. Complete equipment downtime analysis and reporting. Lifetime license with no reoccurring costs. CMMS stands for computerized maintenance management system. Other terms for this category of software are facility maintenance software, facility management software, maintenance CMMS systems, machinery maintenance program, enterprise asset management EAM software, property management software, preventative maintenance (PM) software and so on. As such, these terms are used interchangeably throughout our web site. Certainly, maintenance teams around the world use various CMMS systems to implement their maintenance strategy, day to day maintenance operations and track asset history. Maintenance tracking software benefits nearly any organization where equipment is used. For example, plant maintenance, fleet maintenance, industrial maintenance systems and more. Choose from enterprise, web-based or mobile app versions of the program. Our web site seeks to instruct on how, when and where it is appropriate to use a maintenance management software program and what benefits are obtained from its use. Additionally, there are several case studies that serve as actual examples of successful implementation of a maintenance management system. Lastly, performing a CMMS software price comparison our our software over any of our major competitors reveals that our system easily compares with software costing up to fives times as much. Learn more from this CMMS wiki. CMMS preventive maintenance software modules represent the various capabilities included in a facilities maintenance management system. Typically, the base module is the work order management system. As such, nearly all preventive maintenance software programs have this basic module. Indeed, many systems only have this one module and perform all maintenance functions as work orders. Similarly, our software has the ability to perform all maintenance functions as a work order as well. However, our solution also includes a dedicated PM software module, a downtime module, a complete spare parts management system and a complete purchasing system. Accordingly, one software solution serves all functions of a working maintenance team. Some maintenance teams elect to use all modules other one or a combination of two or more. Of course, the choice is yours. Additionally, our CMMS software includes extensive analysis and reporting for each of the primary software modules within the system. Furthermore, these analysis modules provide extensive key performance indicators (KPI) and reporting information on all aspects of the facilities maintenance management system. Without doubt, these analysis tools guide the maintenance manager in planning, scheduling, compliance, policy making and optimization of the overall maintenance program. Eventually, this leads to cost-savings, a focused and efficient maintenance team as well as a smoother running machinery in general. Our maintenance management system CMMS is designed, developed, supported and packaged in the United States of America. However, our maintenance system CMMS is used by facility managers, maintenance planners and maintenance managers in nearly forty-two (42) other countries worldwide for the past 21 years. Furthermore, our software solution is completely translatable into any language. The Quick Start Guide explains the basics of log in and language selection (if not using the default English). The sample database is populated with sample equipment assets. Additionally, the demo contains a blank database so that you can set up your own company assets. The download for the demo preventive maintenance CMMS software program contains ten different language translations. Granted, these are machine translations and while not particularly accurate they do provide a base to work from. However, the software provides an intuitive translator that guides the user in translating the software text to any language. Contact our experienced support team for a free personalized online demonstration and answers to all your questions. Create a simple repair ticket. Windows 10 PC or Cloud with web-based work request module. Video: How to translate the CMMS program into any language. 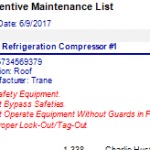 What is Preventive Maintenance CMMS Software? 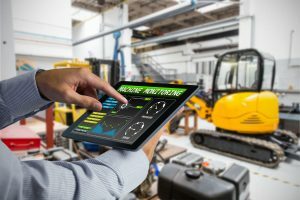 Manage machine maintenance and reduce downtime with CMMS software (also known as a computerized maintenance management system). Companies and organizations use computerized maintenance management systems and maintenance software programs to manage maintenance operations. For example, manufacturing plants, colleges, municipal utilities, hospitality industry, government, fleet maintenance and facility management systems commonly use CMMS solutions for equipment asset management and for tracking maintenance costs. As such, our CMMS system provides work flow management, PMs, equipment downtime tracking, reliability centered maintenance and more. Additionally, software modules for automatic scheduling of work by date/time, meter or event save the manager time and money. How is Work Scheduled and Managed? Typically when equipment needs work an equipment operator submits a repair ticket at their workstation or through a web page. Next, the maintenance manager looks at the repair ticket on his/her computer and elevates it to full work order status. Additionally, a technician is assigned to the work along with a task list, tool list, spare parts list and required due date. Finally, when the job is finished the technician or the manager closes the work request (repair ticket). This job is archived for future reporting. Another way to manage work is by using the preventive maintenance module (PM). This module offers a simple list of calendar-based PM tasks. These tasks are easily checked off when completed. Simultaneously, the software automatically reschedules these tasks and archives the history all in one step. Both of the above work scheduling software modules are used to issue work automatically to a printer or to email at exactly the right time. Lastly, MaintSmart optionally provides an OPC (OLE for Process Control) data link directly to equipment. Ultimately, the equipment tells the software when it needs maintenance through this link. As expected, the system responds with the right work order at exactly the right moment. No other PM system CMMS offers this time-saving, demand-based feature. What Real Benefits Come from Analysis and Reporting? Reporting and analysis of maintenance data is often the "payoff" with maintenance management CMMS solutions. First of all, maintenance history gives insight into future equipment performance and helps track repairs and associated labor. Additionally, reliability analysis links with the PM module suggesting the correct preventive task and interval. This provides an interactive predictive maintenance capability not found in most maintenance management solutions. With this in mind, the ability to create accurate PM task lists with applicable intervals saves time and money immediately while providing additional machine reliability. Reporting tools included in our CMMS include Crystal Reports, direct Excel export, direct web based export, report builder and raw data export. Additionally, the reporting module uses a simple drag and drop capability. As such, software users easily create customized reports of any data by dropping various fields onto the report. Best of all, this useful report builder generates a corresponding chart with the report automatically. Furthermore, the entire data set exports to Excel for more analysis with one button-click! It really could not get much simpler that that, could it? 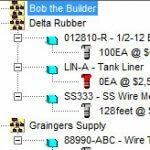 This report builder uses all data in the preventive maintenance CMMS software. In short, create any report you need from any part of the program in seconds! Our enterprise solution is the complete enterprise and maintenance management software solution with all modules included and a perpetual license. Maintenance departments worldwide use our enterprise asset management system for a complete maintenance management solution. Consequently, there is no need to spend more money later when more functionality is needed. Every user receives free email support for life. Try MaintSmart 5.0 (Full Solution) . This is free CMMS software for a 30-day trial. Get the Quick Start Guide too. You buy it - you own it - we support it! The Cloud is version is the complete enterprise CMMS software running on a hosted server. Our cloud experts relieve the user of all software installation, database management, server configuration and maintenance for one low monthly cost. In addition to saving you time and the responsibility of server management this cloud solution is triple redundant and secured with state of the art encryption. Furthermore, unlimited phone support included. The cloud offering is a low cost CMMS software solution paid by monthly subscription. The web-based CMMS solution offered by MaintSmart provides user access to work orders, repair tickets (work requests), maintenance work, failure logging and spares usage. This is a very low cost optional add-on to the main enterprise system. Because of this, economic value this module is especially useful where you have many potential work requesters. Grab Your Free Software Language Translation! Generate work orders automatically, manually, by equipment demand or as scheduled periodic work. Additionally, there a seven ways to create work orders. From very simple to much more comprehensive. Work templates linked to machines create work lists automatically based upon equipment demand. No other CMMS does this. Preventative maintenance management is important to maintain equipment life and reliability. Our CMMS solution provides a simple way to track and schedule PMs. Moreover, this module has a way to link maintenance tasks to reliability analysis to optimize the PM task lists then adjust maintenance work task intervals based upon MTBF. The end result is, smoother running equipment and increased productivity. Tracking down time (equipment failure analysis) is the best way to positively identify problem equipment, procedures and personnel issues quickly and efficiently. Additionally, use downtime information to track specific problems, guide the maintenance manager with OEE (overall equipment effectiveness) and determine equipment MTBF and Failure Rate with our exclusive reliability analysis software module. Inventory use is a big cost center for many maintenance operations. As such, this software solution has a complete purchasing and spares management module. Use this module to track spares usage, purchase requisitions, purchase approvals, purchase orders and even invoice matching. 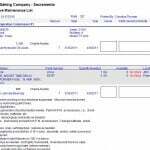 This CMMS is a complete purchasing system integrated into a maintenance work system. How is Our Software Different? Build custom reports with exclusive report builder. Extensive downtime tracking software module guides your predictive maintenance efforts. Uses military standard reliability analysis. One of the only computerized maintenance management systems with OEE (overall equipment effectiveness). Generate work orders automatically by event, condition or date/time. Only machine maintenance application that provides a powerful, flexible and easy to use automatic print and email scheduler. The unique three (3) dimensional equipment hierarchy offers flexible search and reporting. Translate software into any language. All data exports to Excel in seconds. Create a web page of any data instantly. Trigger work orders automatically by schedule or equipment demand. Scalable to any size equipment maintenance operation. 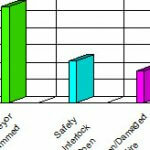 MaintSmart spelling success for maintenance managers in 42 countries for over 21 years. We have been in business twenty-one years. With this in mind, you can be certain that we will be here when you need us. Customize to any equipment maintenance operation. Lead designer of this software a maintenance manager for over 20 years. On the cutting edge with annual updates. We listen to our users and act upon their requests. Corporate social responsibility is an important part of our company strategy. Download the Free 30-Day Full Maintenance Software Solution. This is the full CMMS with a 30-day trial period. Use it as you would if you already own it. Unlimited free CMMS software training with trial download. Contact us for the installer password.